Perhaps the number-one reason for getting Skype is to transmogrify your Galaxy Tab into a phone. The trick works: As long as your pal has a Skype account, you can chat it up all you want, using the Tab just like a phone or adding the video feature for video chat. Touch the Contacts icon on the Skype app’s main screen. Chatting works best when the contact is available: Look for a green check mark icon by her name. Choose Skype Call from the Actions tab on the contact’s information screen. If prompted, choose the contact’s Skype account, not her phone number. In a few Internet seconds, the other person picks up, and you’re speaking with each other. You see the In-Call screen. There’s no time limit, though Internet connection problems may inadvertently hang you up. To disconnect the call, touch the red End Call button. 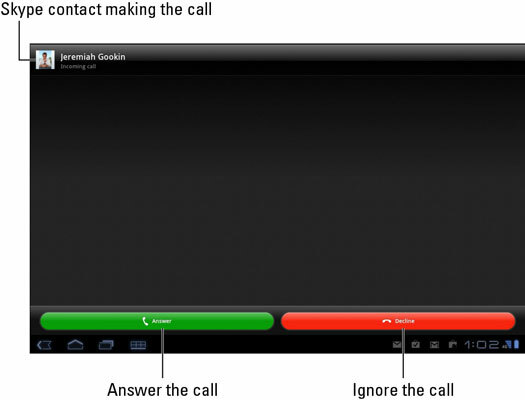 If someone calls you on Skype, you see the Skype incoming call screen. Touch the Answer button to accept the call and start talking. Touch Decline to dismiss the call, especially when it’s someone who annoys you. The Incoming Call screen appears even when the Galaxy Tab is sleeping. The incoming call wakes up the Tab. Voice chat on Skype over the Internet is free. When you use a Wi-Fi connection, you can chat without incurring a loss of your cellular plan’s data minutes. 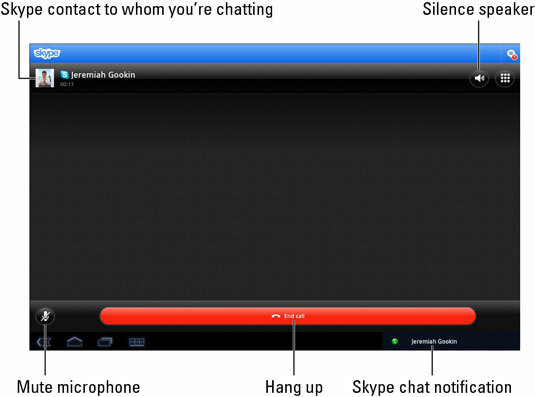 You can chat with any user in your Skype contacts list, by using a mobile device, a computer, or any other gizmo on which Skype is installed. To mute the microphone, touch the Mute Mic button. If you plan to use Skype a lot, get a good headset. When a headset is plugged in, the self-speaker Mute button switches between headphones and the Tab’s built-in speakers. Your Galaxy Tab may be blessed with the ability to make Skype video calls. (The Skype app may not allow video chat on all Tabs.) If so, you can see your Skype contact while you yack with him. Well, it works providing that the other person also is using Skype on a gizmo that features video chat. A video call works similarly to a Skype Call. But instead of choosing Skype Call in Step 3, you choose Skype Video Call. And in Step 4, in addition to “Talk,” you can make funny faces or show the other person around the room. Use the Camera button (in the lower-right part of the screen) to turn the Galaxy Tab’s video camera on or off or to switch between front and rear cameras.